The smaller animals are resting, when Mr Vole brings news: We can stay here, I’ve found us a home . The Mice, Shrews and Voles vote to tell Badger that they are staying. Owl seems delighted that Badger will have yet more problems to deal with. After debating the issue with Mr Vole, Badger is forced to give in and allow the Mice and Voles to stay behind. 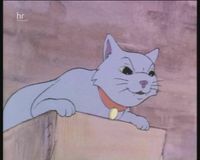 The baby mice are crying a lot and Adder offers to send them to sleep. She starts to hypnotise them, making the animals fear that she will eat them, but she only manages to send herself to sleep! 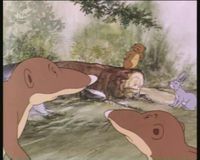 Toad is upset as he feels the animals have lost faith in him, but Badger reassures him and decides it is time to move on. All that remains is to wake Adder, which is left down to Weasel’s singing! The other animals say a fond farewell to the Mice and Voles and start to move on. 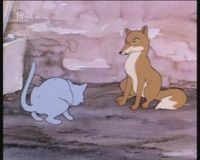 Meanwhile in the town, Fox manages to escape the humans and finds shelter in a yard, where he meets a cat. The cat lets him stay in exchange for Fox killing a few rats for him. Fox falls asleep in a box and wakes up to find himself travelling on the back of a truck. He jumps and stops to rest in a field, talking to a horse. The horse warns him that he is on fox hunting land. The other animals have made little progress, when Suddenly Hare spots a strange bird carrying a dead mouse. Excuse me, but is that one of us? Hare asks the others. Badger asks Hare to go run back and see if the Mice and Voles are alright. Hare is confronted by the chilling site of a thorn bush with the bodies of several baby mice impaled on the thorns. The Butcher bird cheerfully guards his prey. Hare finds the adult Mice and Voles cowering under a bush, the babies have all gone. Mr Vole admits he was wrong, but Badger tells him he was brave to want to stay with the Mice. The animals leave as quickly as possible taking the Mice and Voles with them. Badger is deeply upset at the way things have turned out and blames himself. Toad says they should be able to make it to a nice spinney by nightfall. He is beginning to remember the way. Fox finds an empty earth and goes to sleep. 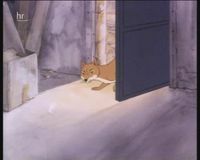 He is woken up by a vixen, who invites him to go hunting with her. Things are looking up! Fox says to himself. Previous: Who Shall Wear The Crown?